This cute little desert fox is the smallest wild dog in the world weighing in at around only 2-4 pounds! In addition to being the world's smallest wild dog, they also have the largest ears relative to body size of any dog. The fennec is only about 8-10 inches at the shoulder but has 6 inch ears! 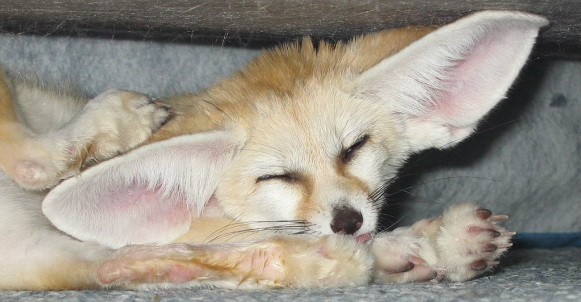 These giant ears help to keep the fennec fox cool in the desert heat and also give him excellent hearing. In the wild fennecs sometimes live in colonies of up to 10 individuals.